Rethink life and livelihood with telework initiatives. How do you manage effectively when people aren't physically there? How do you ensure you aren't overlooked for important meetings, decisions or promotions? What are the new HR issues? 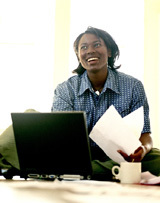 Telework is transforming business. But what will it look like in your organization? New Century Management's experts can help you save time and money as you undertake teleworking changes. We use systems thinking and practical tools to support redefined boundaries, authority lines and relationships among managers, teams, employees and customers. We also conduct initial suitability assessments, provide online coaching support, resolve ongoing problems, and use reliable tools to evaluate your telework efforts. When telework works well, it's a productive intersection of personal and professional lives. We can help you get there.